Seeing a purple colored rash around the eyes can be quite alarming for the patient and others. A heliotrope rash is a symptom of the disease known as dermatomyositis. It is rare, but when it occurs, it can present an array of symptoms including this rash. It can also appear on the chest and upper body in various sizes and shapes. We will look at the different signs associated with heliotrope rash and possible remedies to alleviate symptoms. What Does Heliotrope Rash Mean? The rash is called heliotrope as it resembles the color shade of the heliotrope violet flower. 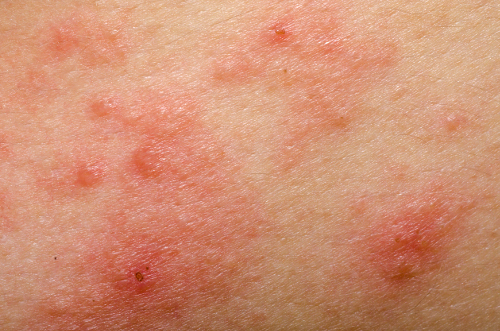 The rash is the main symptom of the connective-tissue disease dermatomyositis. This rare condition results in persistent inflammation of the muscles and skin. The heliotrope rash develops on the upper eyelids as a purple pattern of the flower’s petals with inflammation. Dermatomyositis affects women more often than men, and more cases are prevalent in African-American women. In fact, there are only 10 cases out of every one million adults in the United States. It is commonly seen in adults around the age of 50, while children may have symptoms between the ages of five and 10 years old. The main sign of a heliotrope rash is the purplish violet hue surrounding the eyelid, which is inflamed. Several other factors have a link to heliotrope rash. This pattern has a flat, reddish-purple color spreading across the shoulders, arms, and neck regions. It is affected by ultraviolet rays. Gottron’s sign presents as a flat, red rash on the fingers, elbows, and knees. Gottron’s papules resemble Gottron’s sign, but the rash consists of bumps on the finger’s joints instead of being flat. V-Sign resembles the same flat, reddish-purple rash as with Shawl Sign, except this occurs on the chest in the shape of a V-neck shirt. As the name implies, this condition occurs on the hands with cracking, and the nails are rough and brittle. The tips and sides of the nails appear irregular. With this condition, the inflammation directly affects the blood vessels surrounding the nail bed, creating a red hue on it. Other than that it has an association with the dermatomyositis condition, there is no known cause of the heliotrope rash. It also has a connection with juvenile dermatomyositis and amyopathic dermatomyositis. While the juvenile condition is similar but seen in children, the amyopathic condition does not affect the muscles. It also presents with various rashes. These are some of the factors and conditions that have a connection to dermatomyositis. The risk of dermatomyositis is greater if a family member has had the disease. When the immune system malfunctions and attacks healthy cells, dermatomyositis can occur as a result. Dermatomyositis may increase the risk of having cancer. However, ongoing research will need to show whether the cancer gene has an association with this connective tissue disorder. A prior or existing infection can increase the risk of dermatomyositis. Being exposed to an environmentally toxic substance may put you at a higher risk of contracting dermatomyositis. As a reaction, a prescribed medication may result in this disorder as a side effect. Heliotrope rash differential diagnosis requires several testing methods, as it is crucial to pinpoint underlying cause. A skin biopsy is done on the affected area, and the sample will be sent to a laboratory for further testing. This test identifies blood antibodies to determine if myositis antibodies exist. This testing is helpful in determining the levels of lactic dehydrogenase and creatine kinase, which in high amounts lead to the heliotrope rash. A Von Willebrand’s factor test is done to detect if juvenile dermatomyositis exists. Once a diagnosis of heliotrope rash is confirmed, there are tests to determine the severity level of the dermatomyositis condition. These can include chest x-rays and a pulmonary function test for lung function to check if they are affected. The esophagus may also be affected, so a swallowing evaluation and an esophageal motility study are done as well. An electrocardiogram may be required to check the functioning of the heart. After the all testing is completed and a diagnosis confirmed with a known cause, the heliotrope rash can be treated. Rest is thought to be the best medicine for many ailments and it is no different with this condition. In addition to rest, it is important to perform stretching exercises with splinting physical manipulation, which will help strengthen the affected muscles. Since ultraviolet rays can aggravate the rash, protective clothing and eyeglasses should be worn when outdoors. It is highly advised to avoid direct sunlight. Medical treatments may include an anti-histamine to combat the inflamed area and the itching. Steroidal therapy is also effective and has seen many cases of heliotrope rash reversed. Immunosuppressants and antihypertensive medications may be required for complications of the heliotrope rash. A heliotrope rash is first detected with flat or raised violet-colored bumps around the eyes and on other parts of the body. It is a symptom linked to the dermatomyositis disorder. There are several signs of the rash to watch for and underlying health conditions that can lead to this condition. Some diagnostic tests need to be performed and a few simple remedies can help alleviate symptoms. More severe complications may require medical treatment. Kerkar, P., “What is Heliotrope Rash: Causes, Symptoms, Treatment, Signs, Diagnosis,” ePain Assist, August 30, 2016; https://www.epainassist.com/skin/what-is-heliotrope-rash, last accessed May 17, 2017. “Heliotrope Rash and Other Dermatomyositis Symptoms,” Healthline; http://www.healthline.com/health/skin-disorders/heliotrope-rash#overview1, last accessed May 17, 2017.